It is no secret that I am a fan of Marvel films. One of my friends asked me when I was going to write a negative review of a Marvel film. I told him that I’d write one when I saw a bad one in this new phase of Marvel Film productions. 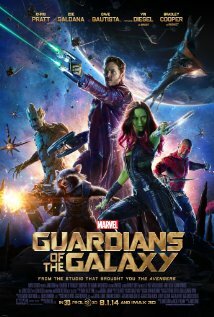 Guardians of the Galaxy was another in a long line of films that I will watch on repeat when I get my hands on the Blu-ray. Comic books translate into film either really well or hopelessly. There have been hits and misses. But since Phase 1 began it has been hard to fault them. I’m even partial to Iron Man 2 (yes I know that is controversial, and it isn’t my first choice but they introduced Black Widow there so I can’t hate on it). Guardians was a risk. It isn’t in the Avengers realm, there isn’t much chance of Iron Man or Captain America showing up (at least not yet in the films). It is a new universe for the Marvel Films to venture into, but the thing is I’ve grown to trust Marvel Films to put on a good show. You know when you walk into that dimly lit cinema with popcorn accidentally spilling onto the floor from your flimsy bucket, that you are in for a fun ride. Whether it is the thriller suspense of Captain America, the action/comedy of Iron Man or the fantasy world of Thor, there is an understanding between Marvel and the audience that you will be met with quality. This bond hasn’t just grown in the cinema over the last six years but over the last 75 years through the comics. We trust that the people bringing these stories to us love them just as much as we do. Guardians is no different in this wonderful, trusting relationship. It is of the highest calibre of comic book film. It has the humour, the action, the villain and the hero (although not the way you would usually think of it) and you have those delicious graphics. The writing is incredible, the story flows beautifully, the characters develop genuinely, and the filming is gorgeous. My favourite part though? (And this probably isn’t a big guess for those of you who know me) Zoe Saldana. In a mostly male cast she holds her own as the strongest character, the one with the best character reveal and development, the one who gives the most and who has the most to lose. Gamora is fierce and there is no one that could do a better fierce than Saldana. Guardians will be a treasure in my heart for a long time. A movie that is fun and adventurous and that genuinely makes me happy. It is so very almost perfect.